The other day, I watched Ina Garten (aka the Barefoot Contessa), make a warm goat cheese salad just like the ones they serve at fancy french restaurants, and it looked crazy-delicious. So last night, I whipped one up for a "light" (and by that I do not mean low-calorie) dinner. It's so quick and easy and, as suspected, trés magnifique. 1. Slice the goat cheese into ½-inch rounds (Ina uses unflavored dental floss to slice the cheese, because a knife blade might stick to the cheese). 2. Dip the cheese rounds in the egg and water, and press into the panko/bread crumbs. Chill the rounds for a few minutes. 3.Heat olive oil and butter over medium high heat. 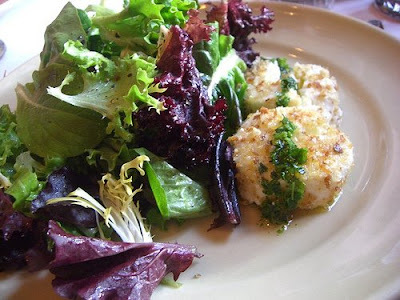 Cook the goat cheese until each side is lightly brown. As you probably know by now, my wild, unbridled spirit cannot be tamed. I go where the winds carry me and do what I please, with blatant disregard for the rules. So, for this salad, I just threw in whatever was in my fridge or pantry that seemed like it might taste good in the mix- asparagus, beets, orange slices... (Yeah, that's right. I'm bad. What are you gonna do about it?) It would also be tasty with strawberries, pomegranate seeds, toasted almonds, or haricots verts, if you also like to walk on the wild side. i love that recipe- always kills a crowd as well. she is always my ace in the hole- but this season is a bit lackluster. weird pairings, repetition and an lack of visual appeal. I'm so excited to learn how to do the goat cheese thing! Sometimes it pays off to have kids to teach you what to do.